When the chancellor announced last November that he would move from two fiscal events a year to one, the Treasury will have breathed a collective sigh of relief. True to the Augustinian tendencies of his office, which encourages its holders to ignore their own stringencies, Philip Hammond qualified his announcement by making clear he planned to make three Budget statements in 12 months. And who can blame him? The Budget is one of those great British events, like the Grand National or Trooping the Colour: the subject of TV specials and newspaper supplements. The media needs its story. And there are always a multitude of sources ready to provide it, some authorised and some not. As permanent secretary I initiated many a leak inquiry. I never caught a single culprit. But the more interesting thing about Budgets is why they maintain their mystique. It is not as if we live any longer in a world of capital controls, fixed exchange rates and endemic balance of payments crises. And with chancellors regularly appearing on the political chat shows the preceding Sunday, the days of Budget purdah have all but gone. But just as the media needs an event, so does the chancellor. The Budget is an opportunity to set out the government’s stall for the year ahead. The political theatre this entails has made the office of chancellor of the exchequer the second most important in the government. And it is why it has taken an austere and principled chancellor like Mr Hammond to move to a single fiscal statement. He may be being astute. The fact is Budgets are remarkably similar. All of the 34 Budgets I worked on as an official had productivity and growth as a central theme. Yet for all the interventions designed to make Britain more productive, the underlying growth rate has remained stubbornly unchanged at about 2.25 per cent. And whenever a chancellor has assumed higher trend growth, such as Nigel Lawson in the late 1980s or Gordon Brown in the 2000s, they have usually had cause to regret it. Fortunately, the creation of the Office for Budget Responsibility in 2010 has put paid to such optimism: not because it is intrinsically better at forecasting, which is a mug’s game, but because it is unbiased. In the old days, much of the debate both within the Treasury and with Number 10 was about the forecast. Now the Treasury can focus on getting policy right. Too often in the past the Treasury obsessed about the level of demand and steering the economy. Very occasionally this has mattered — as in Alistair Darling’s 2008 autumn Budget. But the bias in favour of deficit financing is big enough as it is. In all but four of the past 40 years the government has run a deficit. And a reminder of the difficulty of delivering fiscal retrenchment is that it has taken until the eighth year of governments committed to consolidation to achieve the much less demanding target of reducing public debt as a share of national income. Of course, such is the Treasury’s fear of losing control that it tends to become mesmerised by its own targets and rules. I have seen a number of them come and go. From time to time, they have even had a brief impact. But all too often they encourage the Treasury to develop ever more elaborate fiddles and fixes just to keep on the right side of the rule in question. What matters is the substance: get that right, and rules become irrelevant. Budgets should be about the noble aim of delivering a better tax system. And once in a generation a chancellor surprises us by effecting a tax reform that lasts — think of Nigel Lawson in 1988. All too often they have the prosaic aim of securing the revenue base. There have been extraordinary changes to tax over the past 30 years. The top rate of income tax has been cut from 60 per cent to 40 per cent and then raised before coming to rest at 45 per cent. VAT has been raised from 15 per cent to 20 per cent. National insurance rates have been raised substantially and corporate tax rates halved. New taxes have been created, others abolished. Yet the tax take has remained completely static. Taxes were 33.9 per cent of national income in 1984-85, the year I started work at the Treasury. This year they are projected to be 33.7 per cent. As Mr Hammond contemplates reaffirming his plans for the highest tax take since 1982, he should bear in mind that such a yield eluded his seven immediate predecessors. Of course, whatever goes wrong with a Budget is never quite what you expect. Generally, chancellors are pretty good at getting big measures through: such as, say, 2.5 per cent on the rate of VAT. It is the smaller measures which create the difficulties — think of the “pasty tax” on hot takeaway food, part of the “omnishambles” Budget of 2012. And when the Conservative party is having one of its existential crises over Europe, you have to be very careful indeed. Having been in a room in the House of Commons with Ken Clarke and John Major the night the so-called Maastricht rebels had the whip withdrawn, I should perhaps have spotted last year that Iain Duncan Smith would resign as work and pensions secretary over disability benefits. It is still a little puzzling that someone should resign over a policy he himself announced. Then again, having seen Mr Duncan Smith’s description of the Treasury as the “worst thing in Britain”, I should really not have been surprised. But in the end there is only one certainty about Budgets. The promised land is always four years away. Low rates usually mean low returns; so why are markets so buoyant? IF THERE is one aspect of the current era sure to obsess the financial historians of tomorrow, it is the unprecedentedly low level of interest rates. Never before have deposit rates or bond yields been so depressed in nominal terms, with some governments even able to borrow at negative rates. It is taking a long time for investors to adjust their assumptions accordingly. Real interest rates (ie, allowing for inflation) are also low. As measured by inflation-linked bonds, they are around -1% in big rich economies. In their latest annual report for Credit Suisse on global investment returns, Elroy Dimson of Cambridge University and Paul Marsh and Mike Staunton of the London Business School look at the relationship between real interest rates and future investment returns. Very low real rates have in the past been associated with poor future equity returns (see chart). That may come as a nasty shock for state and local-government pension funds in America. They have to assume a future rate of return on their investments when calculating how much they need to contribute to their plans each year. Most opt for 7-8%, a level that has prevailed for years. That return looks highly implausible at a time when ten-year Treasury bonds yield just 2.4%. There is a strong incentive not to change these assumptions. CalPERS, a Californian state pension fund, has cut its assumed return from 7.5% to 7%. But even that small shift will cost the state $2bn a year in extra contributions. 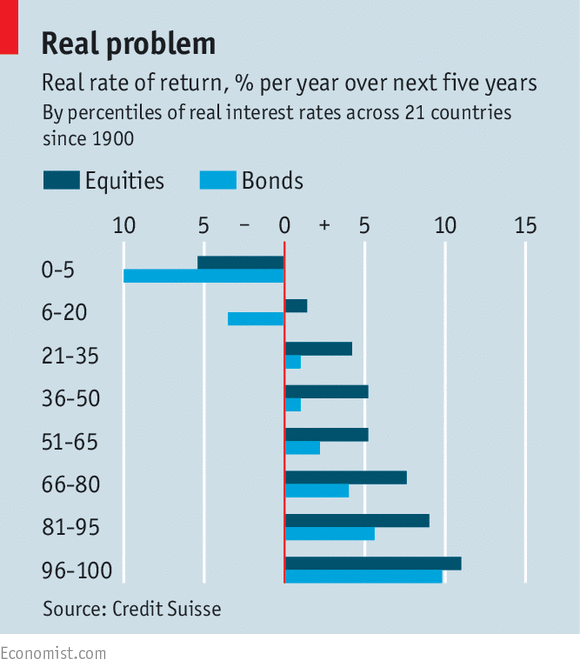 Why should low real rates and low returns be linked? One reason is that very low real rates are associated with times of economic difficulty, and thus periods when corporate profits are under threat. But a low real interest rate also means a low cost of capital for companies, which ought to be good news. Indeed, central banks ease monetary policy to try to drive down interest rates, and thus encourage business investment. A number of possibilities could explain this decline, including a lack of access to finance. Banks have been boosting their capital ratios in recent years and have been more reluctant to lend. But another factor relates to the “hurdle rate” companies use before they decide whether to invest. A survey by the Bank of England indicates that firms are still using a hurdle rate of 12%, around the average of the rate of return on investment they have achieved in the past. In other words, despite the big fall in the cost of borrowing since the crisis, the hurdle rate has not come down. Since the risk-free rate is in effect zero, the bank says British firms are now looking for a 12-percentage-point margin compared with one of seven points before the crisis. This could be a version of “money illusion”, when people fail to adjust their expectations for nominal returns as inflation declines (in this case, both real and nominal expectations ought to have fallen). Indeed, having analysed the data, Messrs Dimson, Marsh and Staunton reckon global investors are expecting a risk premium of 3-3.5% relative to Treasury bills—a level that is lower, not higher, than the historic average. So something does not add up. American pension funds are optimistic. Businesses are cautious. Shares are trading on very high valuations. Not all these assumptions can be proved right. MILAN – A knowledgeable friend in Milan recently asked me the following question: “If an outside investor, say, from the United States, wanted to invest a substantial sum in the Italian economy, what would you advise?” I replied that, although there are many opportunities to invest in companies and sectors, the overall investment environment is complicated. I would recommend investing alongside a knowledgeable domestic partner, who can navigate the system, and spot partly hidden risks. Of course, the same advice applies to many other countries as well, such as China, India, and Brazil. But the eurozone is increasingly turning into a two-speed economic bloc, and the potential political ramifications of this trend are amplifying investors’ concerns. At a recent meeting of high-level investment advisers, one of the organizers asked everyone if they thought the euro would still exist in five years. Only one person out of 200 thought that it would not – a rather surprising collective assessment of the trending risks, given Europe’s current economic situation. Right now, Italy’s real (inflation-adjusted) GDP is roughly at its 2001 level. Spain is doing better, but its real GDP is still around where it was in 2008, just prior to the financial crisis. And Southern European countries, including France, have experienced extremely weak recoveries and stubbornly high unemployment – in excess of 10%, and much higher for people younger than 30. Sovereign debt levels, meanwhile, have approached or exceeded 100% of GDP (Italy’s is now at 135%), while both inflation and real growth – and thus nominal growth – remain low. This lingering debt overhang is limiting the ability to use fiscal measures to help restore robust growth. The competitiveness of eurozone economies’ tradable sectors varies widely, owing to divergences that emerged after the common currency was first launched. While the euro’s recent weakening will blunt the impact of some of these divergences, it will not eliminate them entirely. Germany will continue to run large surpluses; and countries where the ratio of unit labor costs to productivity is high will continue to generate insufficient growth from trade. Since the 2008 financial crisis, the conventional wisdom has been that a long, difficult recovery for eurozone economies will eventually lead to strong growth. But this narrative is losing credibility. Rather than slowly recovering, Europe seems to be trapped in a semi-permanent low-growth equilibrium. Eurozone countries’ social policies have blunted the distributional impact of job and income polarization fueled by globalization, automation, and digital technologies. But these countries (and, to be fair, many others) still must reckon with three consequential changes affecting the global economy since around the year 2000. First, and closest to home, the euro was introduced without complementary fiscal and regulatory unification. Second, China joined the World Trade Organization, and became more thoroughly integrated into global markets. And, third, digital technologies began to have an ever-larger impact on economic structures, jobs, and global supply chains, which significantly altered global employment patterns, and accelerated the pace of routine-job loss. Shortly thereafter, between 2003 and 2006, Germany implemented far-reaching reforms to improve structural flexibility and competitiveness. And, in 2005, the Multi-Fiber Arrangement lapsed. Without the MFA, which had underpinned quotas for textile and apparel exports since 1974, global textile manufacturing became heavily concentrated in China and, surprisingly, Bangladesh. In 2005 alone, China doubled its textile and apparel exports to the West. This development had a particularly adverse effect on Europe’s poorer regions and less competitive developing countries around the world. These changes created a growth-pattern imbalance across a wide range of countries. As many countries took measures to address shortfalls in aggregate demand, sovereign debt increased, and debt-fueled housing bubbles expanded. These growth patterns were unsustainable, and when they eventually broke down, underlying structural weaknesses were laid bare. Resistance to the current system is now growing. The United Kingdom’s Brexit referendum and Donald Trump’s election as US president both reflected public discontent with the distributional aspects of recent growth patterns. And rising support for populist, nationalist, and anti-euro parties could pose a serious threat to Europe as well, not least in large eurozone countries such as France and Italy. Whether or not these parties succeed at the ballot box in the immediate future, their emergence should cast doubt on overly sanguine views about the euro’s longevity. Anti-euro political forces are clearly making electoral inroads, and they will continue to gain ground as long as growth remains anemic and unemployment remains high. In the meantime, the EU will most likely not pursue substantial policy or institutional reforms in the near term, for fear that doing so could adversely affect the outcome of consequential elections this year in the Netherlands, France, Germany, and possibly Italy. Of course, an alternative view holds that Brexit, Trump’s election, and the rise of populist and nationalist parties will serve as a wake-up call, and spur Europe toward broader integration and growth-oriented policies. This would require EU policymakers to abandon the view that each country is solely responsible for getting its own house in order, while upholding EU fiscal, financial, and regulatory commitments. Upholding EU rules is no longer practical, because the current system imposes too many constraints and contains too few effective adjustment mechanisms. To be sure, fiscal, structural, and political reforms are sorely needed; but they will not be sufficient to solve Europe’s growth problem. The bitter irony in all of this is that eurozone countries have enormous growth potential across a wide variety of sectors. Far from being basket cases, they simply need the system’s constraints to be loosened. Will Europe’s future resemble a slow-motion train wreck, or will a new generation of younger leaders pivot toward deeper integration and inclusive growth? It is hard to say, and I, for one, would not dismiss either possibility. One thing seems clear: the status quo is unstable and cannot be sustained indefinitely. Absent a marked shift in policies and economic trajectory, the political circuit breakers will be tripped at some point, just as they have been in the US and the UK. The US dollar is the world's reserve currency. And that isn't likely to change in any radical way, anytime soon. Unless there is some kind of calamitous implosion of the dollar. I am talking about outright rejection and repudiation. And that could happen. The problem is that there isn't another currency that could likely take its place. By the time that possibility becomes a reality, any possible candidates would likely be in worse shape. This includes the Euro and Chinese Yuan. All currencies are substitutes for real money, i.e. gold. And because all governments inflate and destroy their own currencies, the possibility of gold reasserting itself as the international medium of exchange increases considerably under the aforementioned conditions. But, a lot of bad stuff has to happen before we get to that point. And governments around the world have too much at stake to capitulate when it comes to ceasing to issue 'funny money'. So, for the time being, lets focus on things as they are. Which leads us back to the title of this article. Gold is priced in US dollars and trades in gold are settled in US dollars because of the hegemony of the dollar and its role as the world's reserve currency. But what does that mean to others around the world? For example, those who live and work in Germany (euro), Japan (yen), China (Yuan)? It means that holders of any non-USD currency who want to exchange it for gold, must first exchange it for US dollars and then exchange the US dollars for gold. 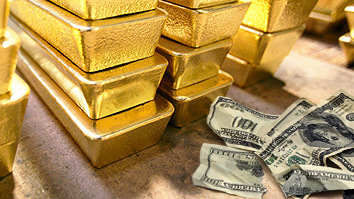 When anyone is selling gold, the proceeds are always paid in US dollars. The dollars can be held as such, or they can be exchanged for other currency. What is particularly important here isn't necessarily obvious. But it is critical when assessing a transaction of this nature. The critical factor is the prevailing exchange rate between the US dollar and the other respective currency. And here is why. On December 31, 2013, gold traded at $1210 per ounce. And on that day one euro could be exchanged for 1.3776 USD. Hence, 842 euros ($1210 USD divided by 1.3776 = 842) could be exchanged for $1210 USD which could then subsequently be exchanged for one ounce of gold. Nine months later, on September 30, 2014, gold again traded at $1210 per ounce. But the exchange rate for one euro was 1.2629 USD. Even though the gold price in US dollars was unchanged, the cost for an ounce of gold in euros had increased nine percent to 958 ($1210 divided by 1.2629 = 958). To be technically correct, the cost of US dollars had increased for holders of euros. On May 31, 2016, twenty months later, gold was again trading at $1210 per ounce. The euro had weakened further relative to the US dollar and the exchange rate for one euro was 1.1131 USD. Using the same math as before, the cost for $1210 US dollars had again increased, this time by an additional thirteen percent to 1087 euros. Over the entire two and one-half year period (twenty-nine months in all) the cost to acquire gold for holders of euros had increased by twenty-four percent. And yet, gold itself, priced in US dollars was the same. There are several things we can learn from this. For one thing, there is always a demand for US dollars since they are needed for use in international trade (oil transactions are priced in US dollars, too). For another, the potential for changes in exchange rates of any other currencies relative to the US dollar must be considered for these transactions. The possible combinations are numerous and always different. An increase in the value of the euro relative to the US dollar in the examples above would have given us results opposite to those which actually occurred. And, of course, every currency other than the US dollar would show different results based on their changes in value relative to the US dollar. Currency exchange rates are continuously changing and so is the US dollar price of gold. It is possible to have an increasing US dollar price for gold and, simultaneously, a stronger US dollar relative to another currency. This results in a 'double whammy' to the holder of a non-USD currency - unless you already own the gold. In our examples earlier, the US dollar price of gold could actually have declined for the periods indicated and still resulted in a higher cost for holders of euros. The US dollar price of gold does not tell us "what gold is doing". It tells us what the US dollar is doing. Or rather, what people think is happening to the US dollar. But what people think is happening changes all the time. Also, the information we are 'fed' by the Fed is suspect and inaccurate. Hence, changes in the US dollar relative to gold are ongoing and can be quite volatile. Over time, however, the gold price in US dollars is a reasonably accurate reflection of the value of the US dollar. The US dollar price of gold does not tell us anything about other countries and their currencies. To know that we must look at exchange rates of those currencies relative to the US dollar. Let's be clear about something. The 'value' of gold does not change. It is original money and its value is constant and stable. And has been for several millenniums. The value of the US dollar, however, changes all the time. This is precisely because the supply of dollars is manipulated by the Federal Reserve via the ongoing expansion and contraction of the supply of money and credit. Mostly expansión.